Patients no longer need to pay for expensive hospital visits. We have an on-site outpatient facility and the procedure only takes about 30 minutes. The recovery is quick, painless, and comfortable. Below you can view the different solutions available for cataracts. Book a free consultation today and let the vision experts at the Yaldo Eye Center help you decide. Yaldo Eye Center has performed well over 10,000 cataract procedures and counting. 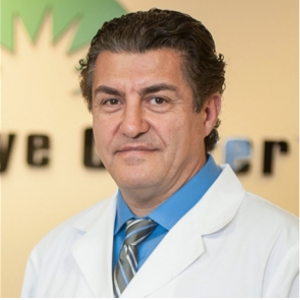 After completing a fellowship in glaucoma and complicated cataracts at the Pacific Presbyterian Medical Center, Dr. Yaldo has distinguished himself as one of the best cataract surgeons in Michigan! A Femtosecond Laser treatment is performed to soften cataracts and break it into small pieces, allowing for safe, quick, and effective removal of the natural lens. Then, an artificial lens is implanted to replace the natural lens. Formerly, artificial lenses corrected only distance vision, leaving cataract patients with a need for reading glasses for near vision assistance. – See near, intermediate and far images in both eyes without glasses or contacts. A variety of Multifocal Lens Implants are available, such as ReStore®, Technis®, and Crystalens®. Our vision experts will assess which option is best for you based on your lifestyle, vision and individual needs. Multifocal Lens Implant surgery is painless. Anesthetic drops numb the eye and an IV delivers medication to keep you relaxed. In most cases, both eyes are done on the same day. In some cases, based upon medical history and other factors, the second eye is done a week after the first eye. Dr. Yaldo will recommend the right course of treatment for you. To schedule a free evaluation and learn more about whether Multifocal Implants is right for you, call the Yaldo Eye Center at 1-800-398-EYES or schedule an appointment with Detroit cataract surgeon, Dr. Yaldo by clicking here. The Most Advanced, Remarkable Implantable Lens To Date! For many people, Lasik surgery can provide even better than 20-20 vision and eliminate the need for reading glasses. But for Michigan patients with cataracts or those who simply want the optimal procedure available, an intraocular lens, or IOL like the Symfony, will leave you breathless at the depth and clarity of your vision. Imagine that you suffer from the cloudy, blurry and altogether impaired eyesight caused by cataracts. Or, you have poor vision that even glasses and contacts can’t fully correct. Then, in a brief procedure, a surgeon implants a lens in each eye that gives you the best vision of your life that will last for the rest of your life. After a short recovery period, you’re reading 6-point type or clearly seeing road signs a quarter mile away. Now, in just the last few months, the FDA approved the TecnisSymfony® IOL to be used in the treatment of cataracts. Whereas the standard multifocal IOLs cater to distinct focal points for varied distances, the Symfony lens boasts no drop off in vision regardless of the distance, meaning that the quality of vision should remain consistent over a full range of viewing conditions. Cataract surgery using traditional lenses is covered by Medicare or insurance and all patients are required to pay are their deductibles, like any other procedure. The additional cost for the newer technology IOLs is why many people still opt for traditional technology and simply use reading glasses after the cataracts are removed. To schedule a free evaluation and learn more about whether the Symfony Lens is right for you, call the Yaldo Eye Center at 1-800-398-EYES or schedule an appointment by clicking here. A “secondary” cataract appears as a cloudy membrane after surgery. It may develop months to years after you’ve had original cataract surgery to remove your cataract and add an intraocular lens (IOL) to replace your natural lens. Michigan cataract surgeon, Dr. Yaldo treats secondary cataracts regularly and can help you if your cataracts have returned. To place the IOL during your original surgery, an incision was made in the capsular bag surrounding your eye’s lens. Although the incision heals quickly, it is not uncommon for the capsule to produce visible cells which can blur and cloud vision. Patients often mistakenly believe their cataracts have come back, when in fact, they’re simply seeing this secondary cataract. Approximately 40% of cataract surgery patients experience this post-operative condition. To remove a secondary cataract, a YAG laser capsulotomy is performed. The YAG laser uses quick pulses of cold laser energy to clear up the cloudy membranes of the secondary cataract without affecting your intraocular lens. Once the cloudy membranes are cleared away, more light is allowed to reach your retina, and your vision will improve. This procedure is done at Yaldo Eye Center’s on-site outpatient surgical facility, a premium Michigan cataract center in the Greater Detroit area. Schedule A Free Consultation at Yaldo Eye Center today to find the best option for you!